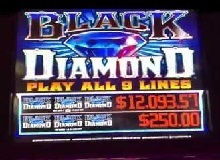 Black Diamond slot machine takes players to the crust of the earth to look for gems. It was first designed for land casinos by Everi and MGS slot developers. The developers provide smooth gameplay. Most of the visual design of this video slot gives the player a feeling of a classic mechanical slot machine. The 9 payline and 5 reels are set on a white background. The slot is more traditional and thus does not use flashy video effects and animations. Diamonds, Bars and 7s symbol are familiar, but they simulate the reels greatly during a spin. The quiz-like sounds in the background encourage players to keep on spinning and give them a fantastic gaming experience. This gemstone themed slot is made for serious gamers, looking for something highly rewarding. When playing Black Diamond for real money, start by placing a bet. The coin value begins from £0.25 to £5.00. Paylines are not fixed, and the player is free to choose the lines to bet on. The betting range per spin ranges from as little as £0.25 to a maximum of £135. It has an RTP 95.95%. The symbols in the Black Diamond game pay generously. Double 7s and triple 7s icons have the highest payouts. Landing three double 7s or triple 7s on an active payline rewards the player 150x and 300x the bet line respectively. The second most valuable icons are the double bar icons and red 7s. Three of a kind of the two symbols on a paying line award 60x and 90x the original stake in that order. The player is also rewarded x30 payout when they land any three bars or three 7s during a spin. A mixed combination of bars pays the least amount since they award 9x the original line bet. Wild SymbolThe logo of the game acts as the wild icon. This wild symbol will substitute all the regular icons in the game to make a paying combination. It, however, does not replace the multiplier symbols. The icon also has the ability to trigger progressive jackpot but only if you are paying with all the nine bet lines. Landing three Game Logos on an active payline pays between 300 and 5000 credits. The payout depends on the betting line where the combination was formed. Bonus MultipliersMultipliers in Black Diamond casino slot online machine can multiply the prizes for all paying combos apart from progressives. If two or more multipliers appear on the same active line, they will multiply together. The maximum multiplier a player can be rewarded in a winning combination is x30. Every symbol in the gameplay has a multiplier of its own. The lowest multiplier is x2 which is available on a single bar, double bar, 7, 77 and 777 icons. The single bar and 7 symbols can also have x3 multipliers. 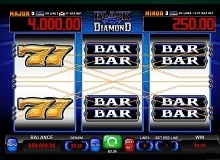 The maximum multiplier in the game is x5 which is available on double bar, double 7s, and triple 7s symbols. Progressive JackpotsPlay Black Diamond slot machine online, and you have a chance to either win a minor or major progressive jackpot. The player has to be playing with the maximum stake for them to become eligible for any of the two jackpots. Landing three Game Logos on the 1st to 8th payline awards a player with the minor progressive jackpot. However, one wins the major progressive jackpot when they land three wild symbols on the 9th payline. 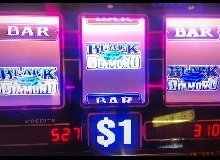 Before you play for real money, it would be better to play Black Diamond free version at online casinos. Player gets the exact feel of the game when they play it for free since the volatility, paytable, betting limits and all other features are the same with the real money version. This slot machine does not feature bonus rounds and animations, but it still stands out. The medium volatile game is ideal for anyone looking for a simple and straightforward game with high payouts.